A third party fundraising event is when a business, organization, community group, school or individual hosts a program or event to benefit ESPCA. It is planned and executed independently of the ESPCA. ESPCA is funded primarily by local donations. In order to help adoptable pets in need in our community we need your help. Listed below are some ideas of the many ways that you can help raise funds and awareness for ESPCA. This list is by no means exhaustive; let our creativity guide you! Collect Donations: Set out collection canisters next to cash registers to encourage your customers to help support ESPCA. Host a fundraiser: Host a benefit concert, have a bake sale, 5K run, a car wash or donate a percentage of designated sale profits. Be creative! Designate ESPCA as a beneficiary for your event. If your business of organization hosts an annual event that generates funds, consider donating a portion of the proceeds to ESPCA. 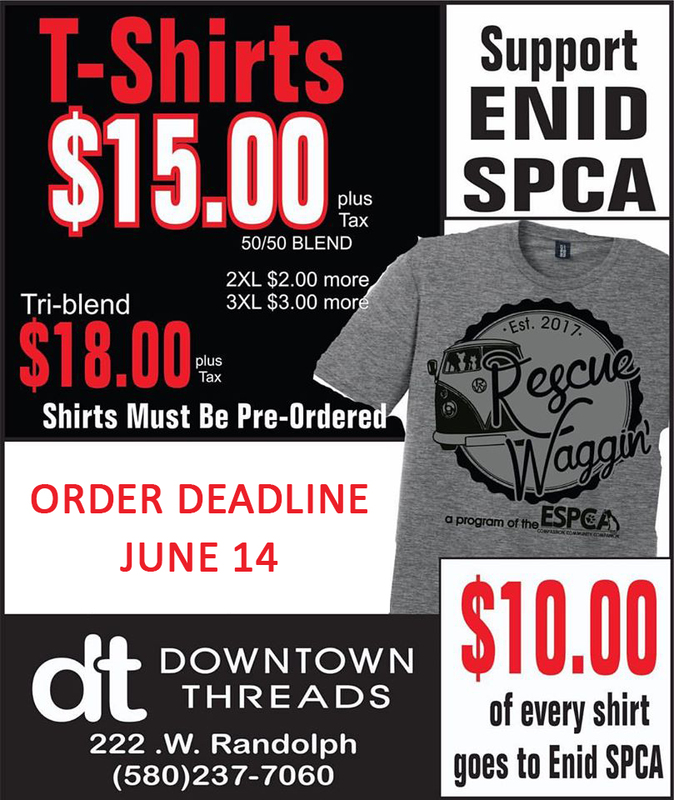 Contact ESCPA Executive Director, Vickie Grantz and submit a Fundraiser Proposal Form by email: director@enidspca.org. Once you have approval of your proposed fundraiser, you will receive a Third Party Fundraising Agreement. After this agreement is signed and returned to the ESPCA, you are ready to start promoting your event! Please make payments out directly to the ESPCA. A tax receipt will be issued to all documented donations. Instead of a car wash, host a dog wash.
Get together a group of friends; gather pledges as fast as you can for 24 hours. Create a restraint taste test event. Allow employees to wear jeans to work once a week for a month with a $20 donation.